A classic film noir story that will have you guessing until the very end. First shown in 1947. When Mark McPherson first falls in love with Laura, he knows he's in love with a phantom—for Laura is dead, and he's in charge of her murder investigation. From her portrait, her letters, her personal effects and from his contacts with the three men who loved her, Mark has created an image of a woman tantalizingly alive and real. As the detective grows obsessed with the case, he finds himself falling in love with the dead woman. What really happened to Laura? 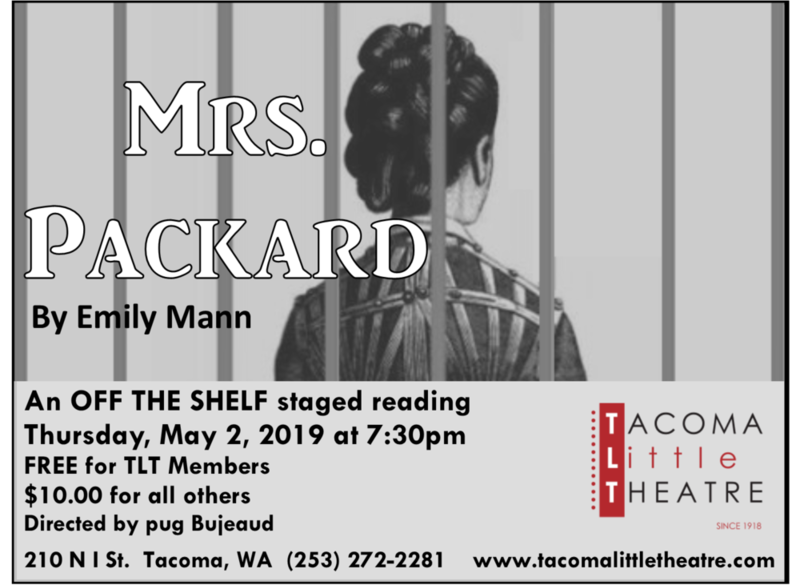 Tacoma Little Theatre's Off the Shelf program is excited to present Emily Mann’s, Mrs. Packard, directed by pug Bujeaud and featuring a some of the Pacific Northwest’s finest actors. This production will play Thursday, May 2, 2019 at 7:30pm. Illinois, 1861: Without proof of insanity, Elizabeth Packard is committed by her husband to an asylum. Based on historical events, Emily Mann's play tells of one woman's struggle to right a system gone wrong in this winner of the Kennedy Center Fund for New American Plays Award. Mrs. Packard features the talents of: Heather R. Christopher (Elizabeth Packard), Brian Jensen (Rev. Packard), Michael Christopher (Dr. McFarland), Shannon Olivia Agostinelli (Mrs. Bonner), Ellen Peters (Mrs. Tenny, Sybil Doyle), Kate Ayers (Mrs. Chapman, Mrs. Ramsey), Drew Doyle (Mr. Smith, Mr. Haslet), Rodman Bolek (Dr. Brown, Mr. Dole), Robert McConkey (Judge, Dr, Knott), and Andrea Weston-Smart (Mrs. Stockton, Libby). Tickets for the May 2, 2019 performance at 7:30pm are $10.00 for non TLT Members, and FREE for those who are members. Tickets may be purchased online by clicking here, or by calling our Box Office at (253) 272-2281. We know that there is a tremendous amount of wonderful theatre that deserves to be heard but sometimes just doesn’t get an opportunity. With “Off the Shelf”, local directors and actors will be bringing some scripts to life that we hope you will find entertaining, challenging and educational to our stage. We hope that you’ll sit back and enjoy an evening of theatre. You never know, you might see one of these shows on our mainstage in the future. Summer Camp 2019 - SEUSSICAL! SUMMER CAMP 2019 - MARY POPPINS, JR.
Tacoma Little Theatre makes you a part of the mob with Mobbed Up for Murder at The Social Bar and Grill. 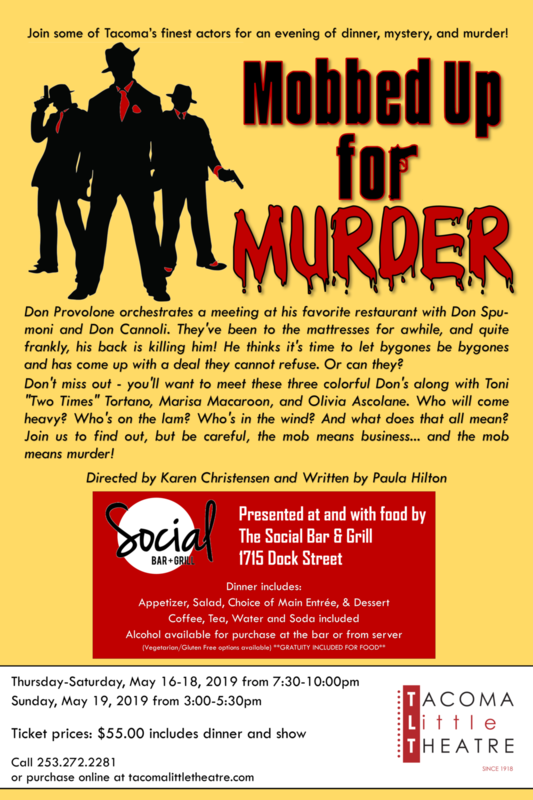 Directed by Karen Christensen and written by Paula Hilton, this murder mystery dinner experience will have you feeling like you’re in a Francis Ford Coppola movie. Don Provolone orchestrates a meeting at his favorite restaurant with Don Spumoni and Don Cannoli. They've been to the mattresses for awhile, and quite frankly, his back is killing him! He thinks it's time to let bygones be bygones and has come up with a deal they cannot refuse. Or can they? Don't miss out - you'll want to meet these three colorful Don's along with Toni "Two Times" Tortano, Marisa Macaroon, and Olivia Ascolane. Who will come heavy? Who's on the lam? Who's in the wind? And what does that all mean? Join us to find out, but be careful, the mob means business... and the mob means murder! Featuring the talents of: Virginia Yanoff, Dana Messina Galagan, Grace Nirschl, Jim Rogers, Kerry Bringman, and Nathaniel Walker. Dinner includes: Appetizer, Salad, Main Entrée (Meat, Chicken, Vegetarian/Gluten Free) & Dessert. Coffee, Tea, Water and Soda are included, and alcohol is available for purchase at the bar or from your server. MOBBED UP FOR MURDER will run May 16-May 19, 2019. Thursday-Saturday performances will begin at 7:30pm, and the Sunday performance will begin at 3:00pm. The event is held at The Social Bar and Grill, 1715 Dock Street, Tacoma, WA. RESERVATIONS ARE REQUIRED. Tickets are $55.00 per person (includes dinner with gratuity and show) and may be purchased by clicking here, or by calling our Box Office at (253) 272-2281. Join TLT in retiring our 62 year old chairs! Fools Play is excited to be back at Tacoma Little Theatre for a third consecutive season! Tacoma’s monthly recurring Improv show. Tickets only $10. This Tacoma staple is a must-see. The cast of Fools Play has two rules: Have Fun and Be Fearless. They take those rules and perform two longform improvised stories full of characters, drama, and humor. For 20-40 minutes, during each story, inspired by each other and you, we get to inhabit the lives of characters in worlds familiar or strange for an epic journey or an intimate glimpse. Entirely improvised, we never know what will happen, but we do know we love discovering these stories. No two stories are ever the same and infinite new stories are just waiting to be found. Unlike our previous two seasons, this year we are changing almost all of our showtimes to 8:00PM!! Please check the details of the Event. Each show will be approximately one and a half hour long including a mid-show intermission. Concessions, including alcoholic beverages will be available for purchase from Tacoma Little Theatre. Show commencement may be delayed if a TLT or another group is using the space prior. Material is unscripted and uncensored. Recommended for mature-minded audiences.